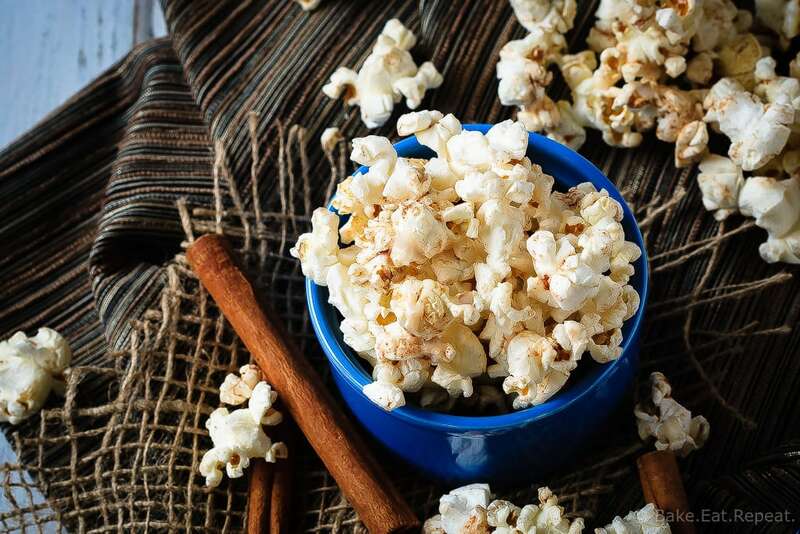 A great way to change up the usual movie night snack, this cinnamon roll popcorn is a wonderful sweet and salty snack that everyone will love! Sweet and salty snacks. Aren’t they the best? I’m always pretty happy when I don’t have to decide between the two when I’m looking for a snack. I’m assuming I’m not alone on that. Also, popcorn is my favourite snack of all time, so this is kind of an awesome recipe. Sweet and salty popcorn that is super easy to make and brings movie night snacking up a notch. Or gets you nominated for mom-of-the-year if you send some in the school lunchbox. Or at least it should. Sharing the cinnamon roll popcorn with the kids instead of hoarding it all for yourself? Definitely mom-of-the-year worthy. Anyways. This popcorn. So easy. 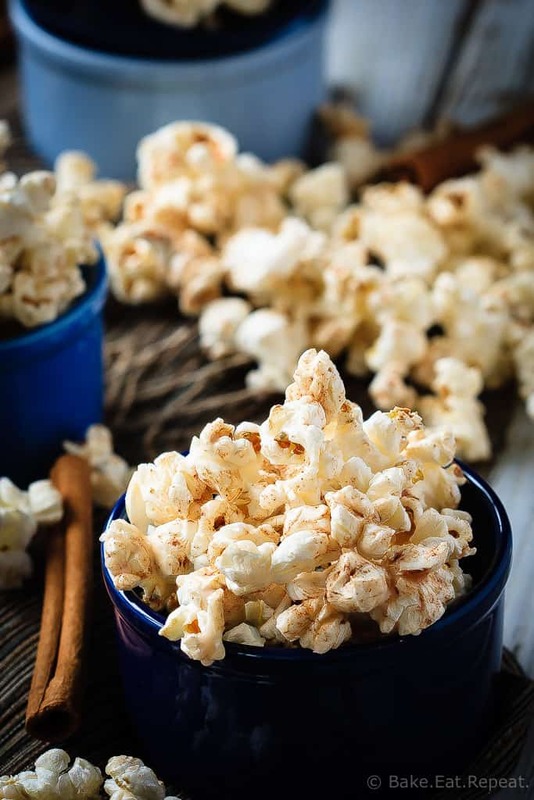 Pop some popcorn kernels, toss it with a butter, cinnamon, and salt mixture, and then drizzle it with a simple vanilla glaze and let it set. It doesn’t get a whole lot easier then that. And everyone will love it. I barely even got a taste of this cinnamon roll popcorn, it went so fast. Although we did have several extra kids over the day I made it, so it was basically gone as soon as I set it out. Good thing I ate some while snapping photos – I might have missed out altogether otherwise! I can’t really blame them for inhaling it so fast though, it is pretty fantastic. Next time I’ll just have to wait until the kids are in bed before I make it. That way the grown-ups in the house can have some too. I mean, of course I won’t do that. Obviously I’ll share wonderful snacks like this cinnamon roll popcorn with the kids. After all, I am going for that mom-of-the-year award. Cinnamon roll popcorn. Make it. You’ll love it. 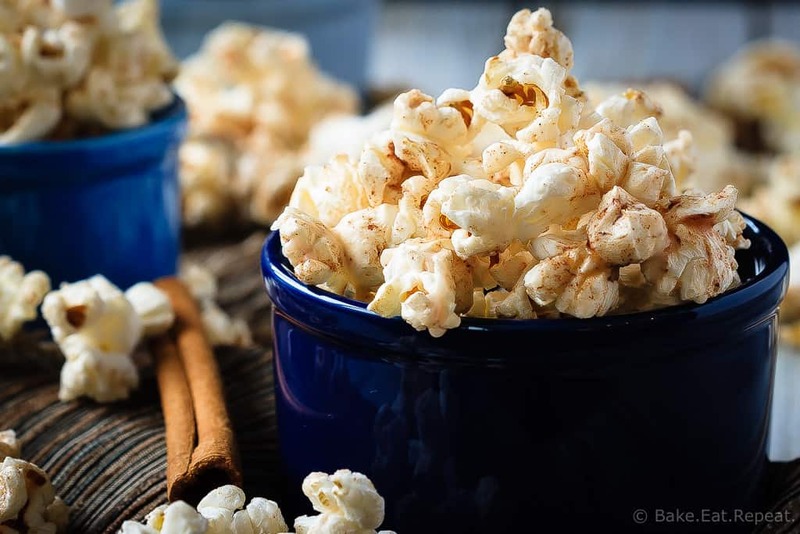 I’ve also shared this Cinnamon Roll Popcorn Recipe over on Food Fanatic. Will this work using microwave buttery popcorn? It should work just fine, but you will have a much stronger butter flavour then since you add butter to the popped popcorn. I would probably omit the salt since there will already be some on the microwave popcorn, and maybe use a little less butter mixed with the cinnamon? That would be personal preference though - if you like lots of butter it would still be fine I think. mmmmm yummy! I just put this recipe together today (finally!!!) and it's every bit as tasty as I expected it would be! Thanks Stacey!